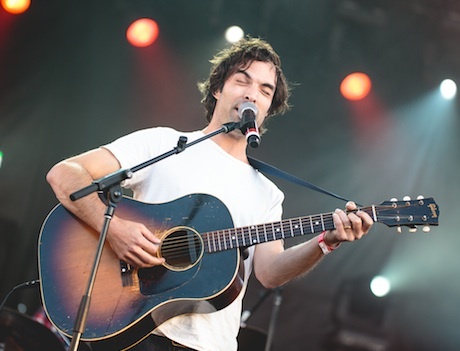 The Barr Brothers took to the stage during the aptly named "magic hour," with the sun setting slowly behind the looming Universite de Montreal campus. Traditionally a four-piece folk band, the Barr Brothers were accompanied by two other musicians on pedal steel and double bass who rounded out their atmospheric sound wonderfully. Rather than spreading out across the large stage as most bands do, they stayed close together, sipping whisky and feeding off their own undeniable energy rather than that of the crowd. Each instrument — from the harp and drums to the guitars and banjo — melded together perfectly with Brad Barr's distinctive voice, which was able to transition from soft and scratchy to guttural and yearning at a moment's notice. While expecting to finish as softly as they began, the set came to a rather abrupt end after the band went over their allotted time, being waved off the stage to make way for Death from Above 1979. Read our October 2014 cover story on the Barr Brothers here.